More than half of parents say mobile phone should be banned inside schools. More than half of parents believe that smartphones should be banned inside school, according to a new survey. 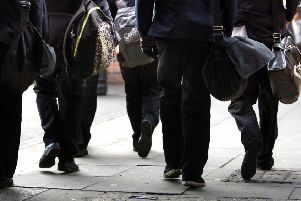 Almost six out of 10 parents (59%) said they think pupils should not be allowed to carry their mobiles around school, but just under half (49%) say they should be allowed to carry them to and from school. "Our research finds that 72% of children in Year 7 have a smartphone and suddenly they'll have the world at their fingertips," explained Carolyn Bunting, chief executive of Internet Matters - who commissioned the survey as part of its Back To School campaign. "Giving a child a smartphone can give parents peace of mind and it offers children fantastic opportunities to learn, communicate and explore. "But if children aren't prepared, they can face many digital challenges including managing friendship groups, pressure to have social media or even pressure to play certain games. "Parents have a major role to play in equipping their children with the right tools to navigate their online world - especially during this pivotal moment when they're facing a raft of change." Of the 2,022 parents surveyed, almost a quarter (27%) said phones should be permitted during break time, while 34% could accept them being used during lunchtime. The findings come as French students return to school with a new smartphone ban in place this September, meaning anyone aged between three and 15 will have to leave their devices at home or switch them off at school. As new starters begin secondary school, the survey also showed that the majority of parents are concerned about the pressures of digital life on their children. One in seven (71%) said they are worried about their child being pushed into sharing images or video, and 73% are anxious about their child's ability to manage online relationships. Cyberbullying is a cause of concern for eight out of 10 parents, with 68% worried about their child feeling the strain of having the latest device. "Children who are starting secondary school are going from being a big fish in a little pond to a little fish in a big pond, and they are suddenly having to find their way," said psychologist Dr Linda Papadopoulos. "On top of that, they have all these new communication tools and kids are starting to interact online - which can be very different from the face-to-face interactions they're used to. "Unless parents take the time to outline the differences of communicating online and offline, and prepare them for how things can be misconstrued online - they run the risk of feeling isolated or even bullied."